Whether you’re experimenting with new recipes or making a simple meal, you need a solid set of cookware. With a polished appearance, stainless steel is considered top-of-the-line in terms of cookware for great reason. Stainless steel is resistant to tarnishing and rust. It’s also ideal for virtually any kind of cooking. With all of the options available on the market, it can be tough to decide on the best stainless steel cookware set for your kitchen. These cookware sets can start to look similar. They vary only slightly by the number of pieces, design accents, and construction materials. To make it easier on you, we’ve put these ten stainless steel sets to the test in our kitchen. With budget-friendly options, high-end brands, and variations by size and style, you’re sure to find a solid cookware set. So, what type of set are you looking for? 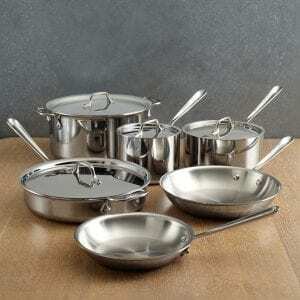 13 Why Buy a Stainless Steel Cookware Set? 19 Is Stainless Steel Safe? 19.1 What About Non-Stick Cookware? 20 Why Does My Food Stick in My Pans? Cuisinart is a household name, and with very good reason. The company is known for providing quality essentials in terms of cookware and appliances. 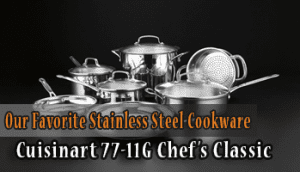 Its Chef’s Classic set of stainless steel cookware is no exception to this tradition. For the college student just starting out or the new homeowner searching for reliable cookware, this set is a great place to start. With the typical mirror finish expected of stainless steel, this set offers versatile performance. It’s stovetop, oven, broiler, dishwasher, and freezer safe to aid with whatever you’re cooking. For a set priced at just over $100, it comes with helpful upgrades to streamline your cooking process. First, the base of these pots and pans are encapsulated in aluminum to improve conductivity and spread heat evenly. This means that there are no odd hot spots to warm your food irregularly or to cause burning. And speaking of burning, Cuisinart has your hands covered there too. This set has patented Cool Grip Helper Handles that don’t heat up on the stovetop. Your cookware won’t surprise you when you go to pick up that piping hot pot! Cuisinart has also offered some nice extra support to lift your heavy, food-filled cookware. We thought that the handles on the glass lids felt nice and secure to the touch. They are wide and easy enough to grab confidently, without worrying about dropping or spilling. Only drawback: the inner edges of the cover can be a bit challenging to clean. All of the rivets feel very solid in your hand for every piece in this set. While the pieces feel solid, they also feel lightweight, which is something to keep in mind if you have your heart set on heavy-duty cookware. Measurement markings along the sides of the steel are another nice addition to make your life easier. This goes especially for any home cooks who are conscious about using and dirtying measuring tools. Also, we loved that the rims of this cookware set are tapered, which makes it easy to pour without spilling. The Chef’s Classic collection is also oven safe up to 500 degrees Fahrenheit, which is a solid place to start for a budget set. 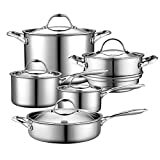 This cookware set includes 1, 2, and 3 quart sauce pans with lids, a 3 quart sauté pan with a helper handle and lid, an 8 quart stockpot with a lid, an 8 inch non-stick skillet, a 10 inch skillet with a lid, and an 18cm steamer insert for cooking and draining vegetables and other foods. If you’re still debating making the jump for this collection, Cuisinart’s lifetime warranty should make your decision easier. The Duxtop brand is famous for its induction stovetops. It’s no surprise that their Professional collection was our favorite on an induction stove. The flat-bottomed pots and pans fit perfectly on our induction stovetop, the pieces heated up quickly, and the heating was beautifully consistent no matter what type of food we cooked. This set was one of the more durable ones we tested. Duxtop claims that this set is built to last for a lifetime, and it’s not hard to believe it. With an 18/10 commercial-grade stainless steel construction, this set was hefty and dent resistant. The bottoms of the pots and pans consist of heavy gauge, impact-bonded aluminum encapsulated by layers of stainless steel for consistent heating throughout. In addition, the riveted handles are ergonomically sound and come with an anti-slip finish to prevent accidents. Though this set is optimal for an induction stovetop, it’s suitable for all cooktops, from electric to gas to ceramic. The Duxtop Professional set is also dishwasher safe, and it’s oven and broiler safe to 550 degrees Fahrenheit. This 17-piece cookware set includes 8 and 10 inch frying pans, 1.6 and 2.5 quart saucepans with lids, a 4.2 quart casserole pan with a lid, an 8.6 quart stock pot with a lid, a 5.5 quart sauté pan with a lid, a boiler basket and steamer basket for your meat and vegetable dishes, and a long spoon, a spatula, and a two-prong fork. One additional perk: you can toss these pieces into the freezer for easy food storage as well. In addition, this set comes with a limited lifetime warranty. The Cooks Standard set of stainless steel cookware offers a range of essential pieces without overwhelming a small kitchen cabinet. Even better, the sizes allow for easy nesting in case you need to make the most of a narrow or cramped storage space, and it comes at a pretty affordable price for the amateur cook. Designed thoughtfully with the home chef in mind, this cookware set has handles that are meant to keep cool longer. We especially liked the V-shaped design of the handles, which lets air pass through freely. Also, the rivets are strong enough to take whatever you can throw at them, and the lids fit securely enough to trap in the heat and moisture. One thing to keep in mind, however, is that the lids are metal, not glass, so you’ll miss out on the easy ability to check your food that some other sets provide. 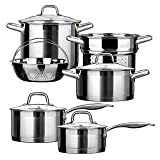 This 10-piece cookware set includes 1.5 quart and 3 quart saucepans with lids, an 8 quart stockpot with a lid, a 4 quart, 11 inch sauté pan with a lid, and a steamer insert with a lid for steaming and draining vegetables. Even as a budget-friendly set, these pieces can tolerate high heat, as the set can take temperatures of up to 500 degrees Fahrenheit. This collection also comes with a limited lifetime warranty. For the professional or home chef who must have the best, the All-Clad stainless steel cookware set is everything you need. The brand is widely acclaimed by renowned sources like America’s Test Kitchen due to its high quality cookware, and in our testing, we found that this set was a great resource for making restaurant-quality food at home. We thought this collection was absolutely beautiful, as it has a nice starburst finish and a highly polished look that gives your kitchen a refined appearance. The cookware also comes with all of the thoughtful touches you’d expect from a high-end set. There are flared pouring rims designed into the sides, the stainless steel is crafted to give superior stick resistance and easy maintenance, plus it won’t react with acidic foods. The handles are large and sturdy, permanently riveted with durable bolsters that make you feel secure carrying a pot or pan from your stovetop to the sink. What really makes this cookware set top-of-the-line is the construction. The All-Clad set makes use of patented D5 technology, which is basically 5-ply bonded construction that alternates layers of stainless steel and conductive aluminum. What this means for the home chef is warp-free, durable strength and consistent heating every time. The interiors are 18/10 stainless steel, offering a forgiving cooking performance. While this set is perfect for any type of cooking heat, we found that it excels when browning or searing foods to perfection when other sets can sometimes fall short. Because the All-Clad set is dishwasher safe, cleaning is easy. These pieces are also oven and broiler safe up to a whopping 600 degrees Fahrenheit. This 10 piece cookware set includes 8 inch and 10 inch frying pans, 1.5 quart and 3 quart saucepans with lids, a 3 quart sauté pan with a lid, and an 8 quart stockpot with a lid. And while they work with any type of stovetop, these pots and pans are actually optimized for induction, making them a great investment if you’re shopping for the perfect match to your induction stovetop. All-Clad also provides a limited lifetime warranty for your peace of mind. Known for offering clever cookware designs, the T-fal brand is a wise bet for the chef who wants to feel at home in his or her own kitchen—or for the aspiring amateur chef. With a full 13 pieces, this set makes it easy to cook a complex meal all at once, or to wisely choose the best piece to fit the recipe at hand. The T-fal Ultimate Stainless Steel collection comes with a brushed and polished stainless steel exterior, with a faint touch of copper coloring at the bottom and handles to create an elegant design. To us, the riveted stainless-steel handles feel sturdy to the touch, and they’ve been ergonomically designed for comfort when handling. One perk of this cookware set is the glass lids, which fit easily to their containers as needed but still have a vented hole to allow steam to escape. This helps prevent your meal from boiling over, and as every chef knows, a watched pot never boils until you look away for just a second to do something else. Chefs will also appreciate the glass lids, which allow you to keep track of the cooking process without letting steam escape. Interior measuring marks and gently flared tulip rims also set these pieces apart from similar cookware sets. The copper design on the bottom of these pots is more than just a graphic. The cookware encapsulates a layer of copper between layers of stainless steel, which not only helps give ultra-fast and even heat distribution but also prevents warping. The bottoms are magnetic, making them compatible with your induction stovetop. What’s more, pieces in this set are oven safe up to 500 degrees Fahrenheit, and they’re dishwasher safe as well. T-Fal has also thrown in a limited lifetime warranty, so there’s no reason not to consider this a great investment. This 13-piece set includes 8 and 10.25 inch frying pans and a 12 inch frying pan with a matching lid. It also has 1, 2, 3, and 4 quart saucepans with lids, a 5 quart stew pod with a lid, and a steamer basket for vegetables. One thing we did notice is that the copper coloring was very slightly discolored after a few rounds in the dishwasher, so handwashing might be preferable if you want to keep that like-new gleam. For the amateur chef trying to prepare large meals, this complete cookware set is ideal. Enter the Chef’s Star Professional Grade set, which comes with 17 pieces of essential cookware for all of your family’s favorite meals. 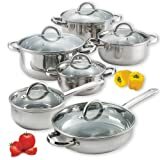 Made with 18/8 commercial-grade stainless steel, these pots and pans are extremely durable. They can withstand whatever you or your children can throw at them. They’re dent resistant, and the bottoms have been encapsulated with impact-bonded aluminum to provide the quick and evenly distributed heating you need to make a meal on the go. A few other touches make this set great for the home chef, or for the cook teaching younger children to cook. The handles are ergonomically shaped, and with an anti-slip satin finish, you can be sure to prevent accidental drops and spills no matter who’s carrying the pot or pan. The riveted handles offer maximum durability as well. Markings on the insides of the saucepans and sauté pan give quick measurements at a glance. No matter what kind of kitchen you have, the Chef’s Star Professional Grade set is suitable for your stovetop—it can handle electric, gas, glass, gas, ceramic, and even induction. And with a lifetime limited warranty, the manufacturer will address any defects you come across. 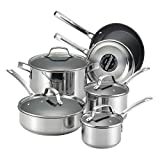 This 17-piece cookware set includes 8 and 10 inch frying pans, 1.6 and 2.5 quart saucepans with lids, a 4.2 quart casserole pan with a lid, an 8.6 quart stockpot with a lid, a 5.5 quart sauté pan with a helper and lid, a boiler basket for spaghetti and lasagna, a steamer basket with folding handles, and a large spoon, slotted spatula, and 2-prong cooking fork to turn over meat. To start, we loved how practical the Calphalon Classic Stainless Steel Cookware set was. At a mid-range price, you get the full spectrum of pots and pans a home chef needs on a daily basis. With a modern, brushed stainless steel appearance, this set comes equipped with tempered glass lids, and the stainless steel rims ensure that the covers fit snugly in place when set. Integrated straining holes make it easy to rinse veggies and more, all without the need for an extra colander. There are also etched measuring marks for easy measurements at a glance. The handles are just as practical as the rest of the set, long and ergonomically designed for an easy and secure grip, even when the pot or pan is heavy with food. They’re also double-riveted for security and stay cool when hot, which are nice touches you’ll appreciate in a busy kitchen. The makeup of this stainless steel cookware set is durable enough to withstand everyday use. One thing we really liked was the impact-bonded aluminum bases. This helps these pots and pans disperse heat evenly and quickly. For this aspect, this set compares to the same quality of a set in a more expensive price range. However, there’s definitely a “sweet spot” for heating food to make sure the nonstick properties are effective, and it can sometimes be hard to get the temperature just right and avoid a long cleaning job. The Calphalon set is also dishwasher, oven, and broiler safe, and all of the pieces work fine on induction stovetops. This 10-piece set includes 8 and 10 inch frying pans, as well as 1.5, 2.5, 3, and 6 quart saucepans with matching lids. Calphalon also provides an excellent full lifetime warranty for all of the pieces in this cookware set. You’ll need to register the set on the company’s website, but following this, any manufacturing defects found in the pots and pans will earn a replacement from the manufacturer. For the home chef on a budget, the Cook N Home set will meet all your essential cooking needs. It’ll do it without losing the benefits that come with stainless steel design. With mirror polished 18/10 stainless steel, we felt that these pieces really shine in the kitchen, and the rivets and handles are durable enough to take a beating. In addition, even with the budget-friendly cost, this cookware set offers the essential benefits you need the most. For example, the glass lids let you check for doneness at a glance without letting steam escape. We particularly liked the sturdy feel of this set, as well as the strong handles, which are designed to stay cool to the touch even on high heat. Also, the bottoms of the Cook N Home collection are made of encapsulated aluminum for optimal heat distribution. These pots and pans are also magnetic, making them induction compatible, and of course you can also use them on other stove types as well (gas, electric, glass, etc.). And you can toss them in the dishwasher just like the most top-notch set when you’re ready to relax after your meal. This 12-piece cookware set includes a 1.5 quart saucepan with a lid, 1.5, 2, and 3 quart casseroles with lids, a 5.5 quart stockpot with a lid, and a 10 inch frying pan with a lid. This cookware set doesn’t come with a warranty, however. In addition, there’s one other important thing to note: while the pots and pans themselves are oven safe up to 500 degrees Fahrenheit, the glass lids are only oven safe up to 350 degrees, so consider your cooking needs before you jump on this purchase. Like the Cuisinart brand, Farberware is a household name. For over 100 years, this brand has been trusted to last. The Millennium Stainless Steel collection is designed to bring a touch of elegance to your kitchen, without sacrificing durability. We loved the professionally styled, polished stainless steel. The pieces are very gently flared to give a nice tulip shape. This cookware set comes equipped with glass lids to help you keep track of your recipe’s progress. All that without letting steam or moisture escape. The handles on the lids and pots and pans are firmly riveted to the pan. They are durable and feel sturdy and comfortable, staying cool even during the cooking process. Be sure to take note of the sizes of these pieces, as you’re getting two relatively small saucepans and one large stockpot, with nothing in between. So take stock of what your kitchen needs. The bases of all of the pots and pans in this cookware set include a thick aluminum core fully encapsulated by stainless steel. In testing, we were impressed by the excellent heat distribution for cooking everything from vegetables to steak. 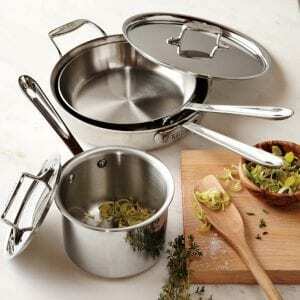 The stainless steel base makes this cookware set ideal for any stovetop type, including glass or induction. Also, you can throw this set into the dishwasher as needed, and the pieces are also oven and broiler safe up to 500 degrees. This 10-piece cookware set includes 1 and 2 quart saucepans with lids, a 3 quart saucepan with a lid, 8 and 10 inch skillets, and an 8 quart stockpot with a lid. The limited lifetime warranty from Farberware guarantees a defect-free product, or the manufacturer will replace it. For most home chefs, one of the biggest drawbacks to cooking is the cleanup that follows. Circulon’s response to this struggle is its Genesis Stainless Steel Nonstick collection. Its unique TOTAL Food Release System features DuPont Autograph nonstick coating on raised circles, making cooking release and cleanup easy. The coating is PFOA-free, which means your food stays free from harmful chemicals, and it’s also designed to be utensil safe. We loved this set because it gives all of the enviable benefits of nonstick cooking, with the elegant style of stainless steel. You get the scratch and stain resistance you’re looking for, without wondering whether your food will come out without chipping away at it. This collection uses impact-bonded aluminum for its bases, ensuring even heating, and the stainless steel works on all stovetops, including induction. The stainless steel handles felt pretty solid, as the double riveting provided a little extra strength. One extra nice touch was the glass lids, which are fully shatter resistant. This cookware set includes 1 and 2 quart saucepans with lids, a 3 quart saute pan with a lid, and an 8.5 inch and 10 inch skillet. A drawback during our testing was that the handles seemed to heat up a little more than other sets. You may still need a pot holder for some dishes. There are a few important things to keep in mind if you’re considering purchasing a set of stainless steel cookware. You’ll want to know the advantages of stainless steel, how to decide what size you need, and considerations for induction stovetops. In addition, it’s essential to know how to use and care for your cookware set. This way, your investments will last for years to come. 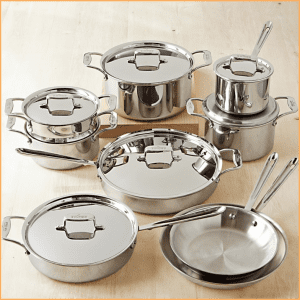 Why Buy a Stainless Steel Cookware Set? This grey steel alloy shines like a mirror and gives a classic, polished look to go with any kitchen design. It can also be given a brushed finish for a modern appearance. Stainless steel is a hard material, and it doesn’t really dent. It can also tolerate high levels of heat, so you can do a lot with it in the kitchen. Since it’s also very scratch and stain resistant, that means you don’t really need to worry about chipping or rusting, at least not if you’re taking proper care of the set. Also, since stainless steel is non-porous, it doesn’t not react or degrade with exposure to acidic foods. No matter your budget, it’s easy to find a set of quality stainless steel in nearly any price range. At higher budgets, the sets offer some serious perks to make your cooking experience more smooth. Note that stainless steel’s conductivity can be greatly improved. This can be done by adding more layers of copper or aluminum to the bottom or sides of the cookware. That’s why purchasing the best set you can afford means more consistent heating capabilities. 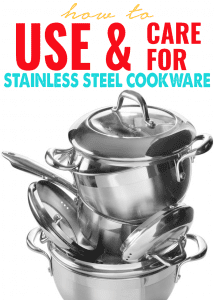 It’s possible to invest in a good stainless steel set and keep it for a lifetime. Many manufacturers know this, and they add lifetime warranties to these sets to back their products. If you take good care of your stainless steel cookware, you’ll be able to pass it on to your kids or even grand kids! Before you jump into a purchase, consider what you have and need in terms of individual cookware. If you need only a few pieces, we recommend that you find individual replacements or get a smaller set. On the other hand, if you’re starting from scratch, it’s best to invest in the largest cookware set you can find. A good choice would be the Chef’s Star Professional Grade collection. If you find yourself cooking often, you’ll want to make sure your cookware set covers your cooking needs. Even the most basic stainless steel cookware set, like the Cuisinart Chef’s Classic collection, will start you off with a skillet, saute pan, and saucepan. If you know you need accessories like a slotted spoon or a boiler basket, it’s usually less expensive to get a set that includes one. Frequent cooks will also want ergonomic handles, easy pour holes, and easy grips. This can be found in the All-Clad collection. Such sets are more than “worth the money” when you want to make sophisticated meals. Lastly, be sure to consider the sizes included in the cookware. Those inches and quart sizes may not seem important on the front end, but if you’re cooking for a huge crowd with a 5 quart saucepan as your largest piece, you’ll regret not finding a set with a larger one. Similarly, those with a small kitchen should look for smaller sets, such as the Cooks Standard Multi-Ply. While stainless steel cookware generally works well with any type of stovetop, certain collections are optimized for specific kinds of heat. For example, if you have an induction stovetop, an induction-friendly set like the Duxtop Professional is the right fit. Otherwise, you’ll want to keep an eye out for magnetic, flat-bottomed stainless steel cookware that will work well with the magnetic induction burner. First, know that stainless steel on its own doesn’t conduct heat very well. A cookware set that is purely stainless steel will give you irregular heat spots. You’ll want a set that has aluminum and/or copper clad into the base to give you the best heat dispersion for all of your meals. Next, go for 18/10 or 18/8 commercial-grade stainless steel when you can find it. This type of stainless steel has both chromium (18%) and nickel (10% or 8%, respectively) and is designed to be long-lasting, which can add several more years to your investment. Higher chromium also means higher resistance to corrosion, which helps maintain the appearance of your cookware collection. If you often steam vegetables, rice, and other foods, getting tempered glass lids is a must. Without them, you’ll need to remove the lid whenever you need to start checking food for doneness, which can release steam and make it take longer to finish cooking—which is definitely a source of frustration if you cook frequently. Make sure you get a set with durable handles designed to keep cool. This can seem like a minor issue, but there’s nothing worse than nearly burning yourself every time you go to move a pan off of the stovetop. Worse yet, feeling like your full pot of soup is too heavy on the way from the stove to the sink. And if you cook often enough, finding a set with ergonomic handles can be well worth the extra money. Stainless steel cookware sets are a big investment, and a good collection can last you a lifetime. Make sure that you know how to keep it sparkling new, so you can pass it down to a family member when you’re done with it! Important note: most warranties do not cover any damages due to scratches, stains, discoloration, accidents, or other blemishes due to improper use. This includes overheating or the improper use of cleaning materials. Make sure to read on so you don’t void your warranty when you need it most. Dry your pot or pan immediately after washing, whether you’ve used a dishwasher or washed the piece by hand. Wash pieces by hand if you’re looking to keep that polished shine, as dishwashers typically leave small water spots. Let the pan cool off before washing it. A quick change in temperature can occasionally make the stainless steel bend or warp. 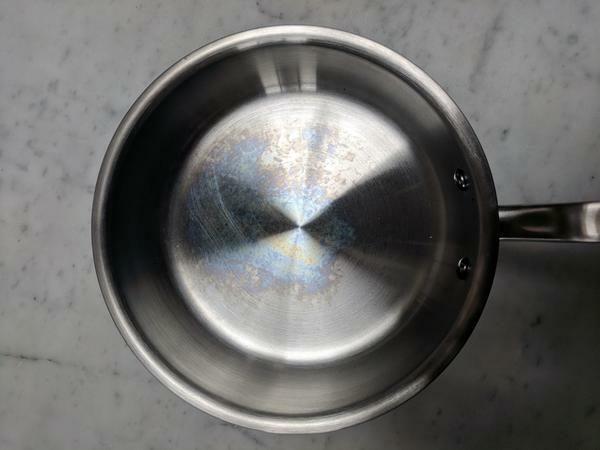 Clean your stainless steel cookware after each use. If a film of food is left, it may cause discoloration on the pan the next time you heat it up. Don’t use abrasive sponges, steel wool, oven cleaners, scouring pads, or harsh cleaning chemicals like bleach on your pots and pans. Doing this will damage the polished, mirror-sharp finish. Do use Barkeeper’s Friend as cookware cleaner for hard-to-clean pots and pans. If you have it, we recommend using this cleaner occasionally for any tarnished or burnt areas, and it can also remove those chalky white mineral deposits to keep your pot looking like new. You should also consider using an oil base over your pots and pans on occasion. 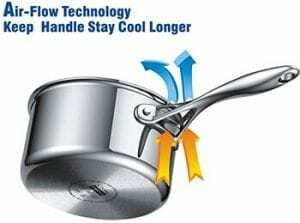 This creates a barrier between your pan and your food and prevents any metal from leaching into your food. Don’t add salt to water until it’s come to a boil. If you add salt to water before it’s hot enough for the salt to disperse and dissolve, it can lead to what’s called pitting corrosion. This puts permanent pockmarks in the shiny bottom of your pot or pan. Don’t put any kind of cooking oil into a pot or pan until the pan is warm. 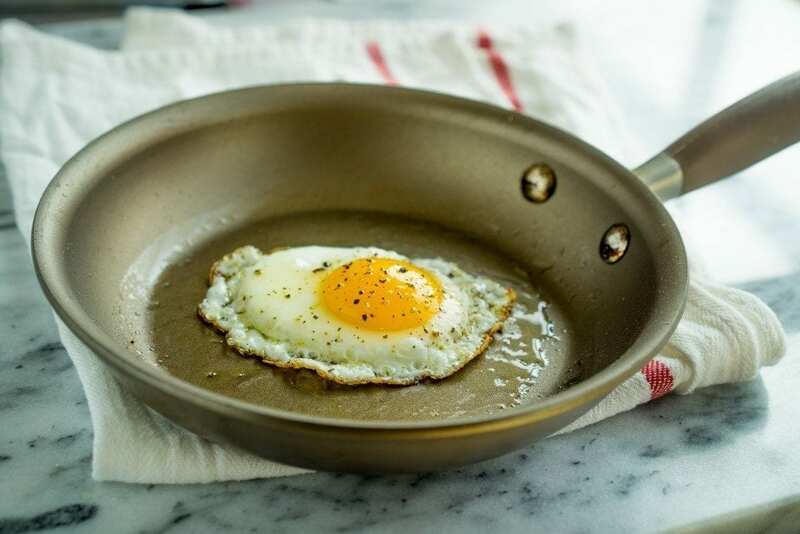 This can make the steel surface become temporarily nonstick, or “static.” If you’re not sure whether your pan is hot enough yet, do a quick water test by flicking a drop or two of water into it. If the water sizzles, you’re ready to go! If not, wait a bit longer. Don’t overheat your pots and pans. Stainless steel is designed to disperse and hold heat evenly. Overheating it to speed up the cooking process can not only burn your food, but it can also cause blue or brown stains to occur. 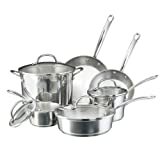 Most cooking sets are described as being made of 304 or 316 stainless steel. Many consumers overlook these details, as the numbers seem irrelevant. Stainless steel is just stainless steel, correct? However, the grade of stainless steel can be incredibly important depending on how are you are using your cookware. 304-grade stainless steel has 18% chromium in it and 8% nickel. This is a surgical grade stainless steel and is considered one of the best on the market. It is unlikely to corrode and will heat more evenly in your kitchen. Meanwhile, 316-grade stainless steel has 16% chromium, 10% nickel, and 2% molybdenum. You’ll notice the addition of molybdenum. This ingredient prevents the pan from being corroded by saltwater. If you plan on keeping your pots and pans for a long time, you will certainly want to choose either 316 or 304 stainless steel. Other grades, such as those found in the 200 are cheaper but corrode much more easily. This is because they do not have nickel in them. You can purchase 200-grade stainless steel pots and pans, but be aware they may not last you long. Something that is unknown to most stainless steel pan owners is that the core of their pans is often made of aluminum or copper. This is because aluminum and copper distribute heat better throughout the pan. The stainless steel merely coats the outside of the pan. Additionally, as stated in the previous section, most stainless steel coatings are combined with nickel or chromium or both. These metals can be extremely toxic to humans. When you simmer food for a long time, the metals eventually leak into your food. This can cause anything from acne outbreaks to forgetfulness, and possibly worse conditions. If you are suffering from any of these symptoms, consult your doctor. However, remember that the 300-grade stainless steels largely keep you protected, as there is very little leaching occurring from the metal into your food. Likewise, you can purchase stainless steel grades as high as 400. While these are more expensive, they will protect you and your family. Again, it is our recommendation that you do not purchase a stainless steel grade below 300. These products cause quite a bit of metal leaching and can have an incredibly poor impact on your family. Remember, non-stick cookware can be incredibly dangerous for your family. Pots and pans coated in Teflon can easily scratch. When Teflon scratches, pieces inevitably end up in your food. These pieces, which have often been processed with perfluorooctanoic acid, are linked to cancer-causing agents. Additionally, when Teflon is overheated, it can cause flu-like symptoms for anyone who breathes it in. We recommend that you use stainless steel for your cooking needs. Why Does My Food Stick in My Pans? So, you bought a stainless steel cookware set, but now all of your food is sticking to the pan when you cook. What are your options? Seasoning the pan, of course! The steps to seasoning your pan are simple. Once you complete these steps, your pan should stay naturally stickless for a long period of time. First, heat your pan on the stove until it is hot. Then, add an oil designed for high heats, such as butter or coconut oil. Make sure you swirl the oil, as the entire pan needs to be covered. If you skip this step, you will have spots where food sticks and spots where food doesn’t! Allow the oil to heat until it begins to smoke. Yikes, this part sounds scary! But don’t worry, this is how the pan becomes seasoned. Remove the pan from the heat and allow it to cool completely. Then, simply wipe out the excess oil and prepare to be amazed! Seasoning your pan should completely remove the need for you to use oils or butter when cooking in your stainless steel pans. One last tip, to make sure your pan has been seasoned, you should be able to see your own reflection in the bottom of the pan. Keeping the maintenance needs of this cookware in mind, you’ll find that your stainless steel has a very long life. This is why it’s so crucial to pick the perfect set on the front end! Hopefully, this guide has given you an idea of which direction to go when choosing a stainless steel cookware set. We hope this will really bring your cooking game to the next level. What’s your favorite cookware set? Share with us below!